The requirement is to develop a sensitivity to different aspects of the park and to find imaginative and expressive ways to respond to, document and share what is discovered and in turn inspire other park visitors to be equally imaginative. During disucussions regarding the different types of maps I looked into Situationist maps and in particular the Guy Debord 1955 Psycho-geographic guide of Paris. This map had been divided into segments and the areas within the map had been separated. 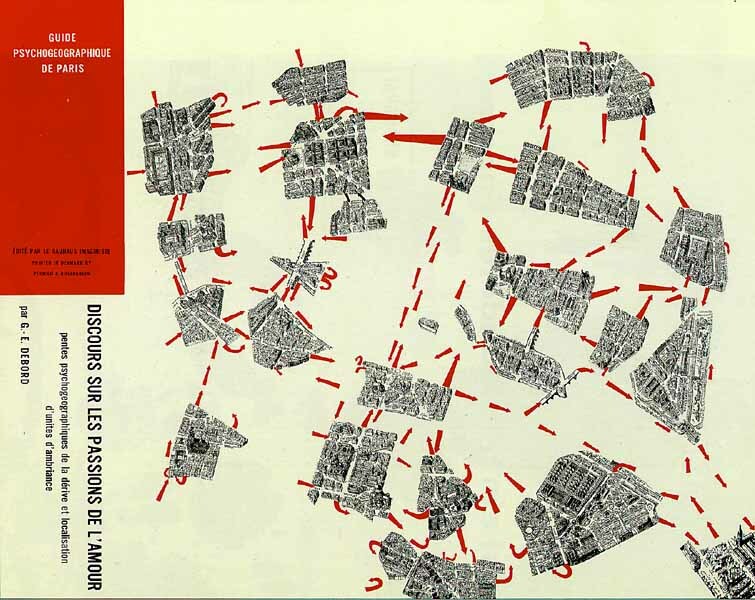 The object of the Situationist map was to enable a participant to wander or drift around the city, making their own paths to where they wanted to go. Surrounding area; Perimeter of park; Culture; Living things; Found objects; Those things forgotten. Some of these themes I linked into my major project entitled ‘The Documents of Life’. I took a 60 step walk from the Furtherfield Gallery and recorded this by use of panoramic photography, a type of photography I hadn’t explored before, so that I could capture exactly where I had been. I took a picture every 5 steps. I was observing the pathway, the fenced off parts of the park, the signage, people, trees, rubbish, discarded objects and getting a general feel for the overall place. Categories where then allocated to observe and record. My category was Rules and Order (including rules that could be broken). These were also recorded on camera and with sketching/notes. I have several ideas involving the collaboration of the community in the creation of a networking physical map. The first idea is to invite members of the public into the gallery to draw their own map walks of the park for someone else to follow and these will be displayed on the walls. The other ideas are that the maps could include: Treasure maps with hidden treasure, an exchange map – this includes a place where a book is left and the visitor will replace the book with another book or a book exchange where books that people no longer want are exchanged or given away and a route map – this could map someone’s favourite walk. Whilst thinking about networking eg. facebook I wanted to create another way of bringing the community together and thought about doing this by encouraging people to link up with each other by bringing networking into the visible world. This would be done by encouraging people to leave a note, a photograph, a drawing, an object or anything else that represents them onto the map wall. 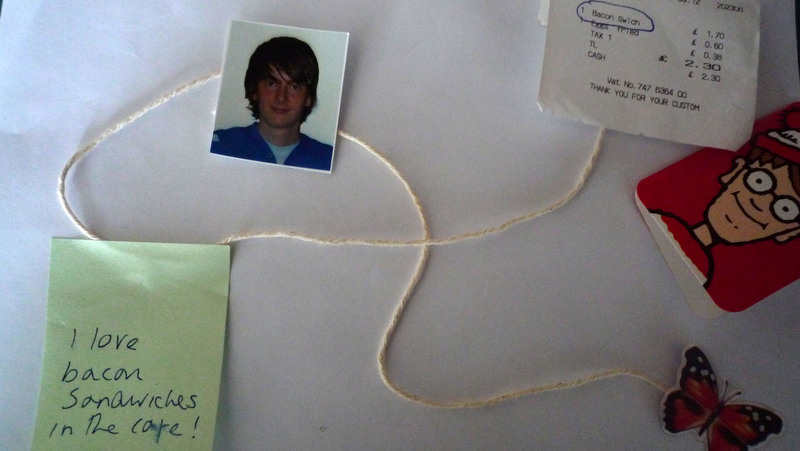 Then as this map is added to, a person who has a link with another person in some way, will be able to link themselves with that person with the use of a piece of string or wool. The map will then look like a mass of communication connections. This is a way of making networking, the people and the connections reappear in the real world and real time. I decided that in reality and due to short timescales I wouldn’t be able to effectively carry out this task, to reach the level of success I would need to produce a large networking map and record my findings. I also didn’t think it would be ideal to set up this task in the class as everybody knew each other pretty well and the map is ideally aimed at strangers sharing common interests. I therefore, picked one of my first ideas of book sharing to carry forward. Realms – using existing paths to allocate area. Our objective is to breakdown familiarisation and create an environment of creative interaction – (weird things). We are suggesting ways in ‘not to behave’ and non events. We are enabling a new train of thought. The participants are recognised, but not defined by our simple logo; an ‘!’, on an orange background. This will be incorporated onto tee shirts, badges and maps and any of our group material. Our logo stands for freedom, fun and frollicking and will be incorporated on our printable map and guide to your enjoyment and fun within the realms of the park. We are planning to write a manifesto based on our ideas of the 3 ‘f’s! Our social networks and recordings will be the evidence of participation. Anyone can collaborate and pariticipate in our movement. Russell and myself have set up a facebook page which links to the google map highlighting ‘participant’ events within Finsbury Park and encourages other participants to join by pressing the ‘like’ button. This enables people to see where the events are being held within the park, and they are able to contribute by posting photos, information, their thoughts etc for other participants to see and these all link in with the main website. 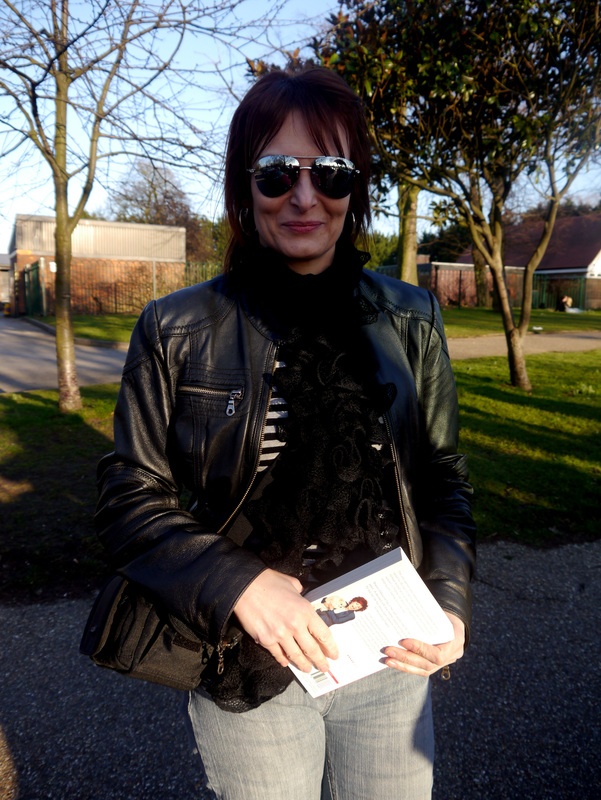 The first event I have organised and posted was a ‘participants book exchange’ where anyone is invited along to bring a book they no longer need, and swap it for another book or just pass it on to someone in the park as a friendly gesture. This ran on Saturday 25th February from 1pm and we hope to run these every 2 months in conjunction with having a book bin or shelf within the gallery where people can swap books of interest. (The next one will be in conjunction with the next Furtherfield Gallery event on Saturday 16th June). I advertised this event through the facebook page that was created. 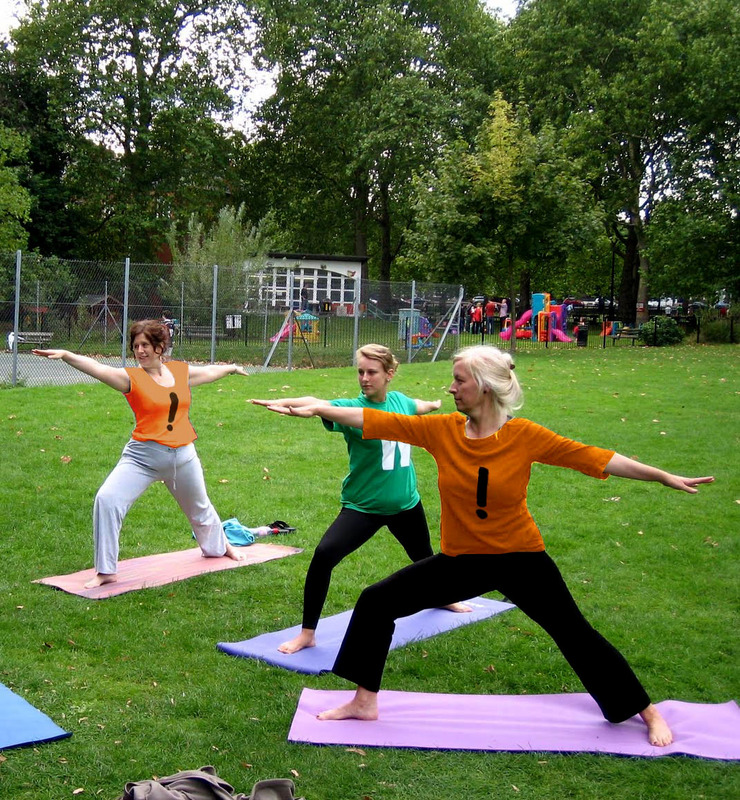 https://www.facebook.com/#!/pages/The-Participants-Finsbury-Park/389130407767879 . This is also linked onto the main Participants Website www.russb.co.uk/theparticipants and the googlemap marks the spot where this will take place with dates and timings. I have posted the pictures onto the Participants Page on Facebook and I have also started a Flickr page where people can add their photos too. This will be linked into the main web page. http://www.flickr.com/groups/1899436@N24/ . I have also linked the pictures to another flickr Finsbury Park Page to spread out to a wider audience. This brief has taught me about the ways in which we link the internet together to make people aware of what is going on in the world, supplying them with information about events, places, history, what has taken place, links to add their own information etc. It will be valuable information that I can use going forward in my chosen career of teaching. It also gave me the tools to base my second workshop with the homeless teenagers on ‘A Journey’ and ‘the Environment in which we live in’. I asked them to not only think about taking snap shots but use their imagination when they are out and taking photographs and to really think about the places they are visiting. The themes I have used tie in with my initial observation themes and the themes we were given on the day we visited the park. I look forward to seeing what photographs they have taken upon their return from Holland. Report on how I have maped the ecology of the park. What were my influences, what tools did I use, what was my approach.